Sacramento, Calif. (April 20, 2011) – In a precedent-setting decision, issued today in the United States District Court, Eastern District of California, Judge Morrison C. England, Jr. rejected the U.S. Department of Interior’s motion to dismiss a lawsuit challenging the roundup and removal of nearly 1,579 wild horses and 159 burros from the Twin Peaks Herd Management Area (HMA) in northeastern California last year. Judge England also ruled that the plaintiffs – animal protection organization In Defense of Animals (IDA), ecologist Chad Hanson, Ph.D., wild horse sanctuary founder Barbara Clarke, DreamCatcher Wild Horse and Burro Sanctuary, local resident and wild horse enthusiast Linda Hay – have standing to challenge the action and that the case is not moot, despite the fact that the roundup has already taken place. In past wild horse roundup litigation, courts have dismissed claims as moot because the roundups had already concluded, never ruling on the merits on the case. However, In Defense of Animals et al. vs. Interior Department et al., headed by pro bono legal counsel Rachel Fazio, outlines specific remedies and the ongoing harm plaintiffs suffer from Twin Peaks mustangs being held in captivity in government long-term holding facilities – facilities that the plaintiffs allege are illegal. Fazio argued in her briefs that the case was not moot, in part because the Interior Department could return captured horses to the range. Plaintiffs in the litigation include ecologist Dr. Chad Hanson, a researcher at the University of California at Davis and author of numerous scientific studies, Barbara Clarke, wild horse expert and director of the 2,000-acre DreamCatcher Wild Horse and Burro Sanctuary in Northeastern California, the DreamCatcher Wild Horse and Burro Sanctuary itself, ecologist Dr. Chad Hanson, Linda Hay, a local resident who has visited and enjoyed the Twin Peaks horses for the past thirty years, and animal protection organization In Defense of Animals. In addition, the plaintiffs have appealed to the Ninth Circuit Court of Appeals Judge England’s denial last year of a preliminary injunction to halt the Twin Peaks roundup. The remedy of returning horses to the range was also a critical issue of discussion at a hearing before the Ninth Circuit in San Francisco earlier this year. Meanwhile, Twin Peaks horses have been scattered across the country at Interior Department’s Bureau of Land Management (BLM) holding facilities, and untold numbers have perished while in captivity. Plaintiffs have revisited the Twin Peaks area and report difficulty locating wild horses to view in the aftermath of the roundup. Between August and September 2010 – the hottest months of the year – the BLM removed 1,579 wild horses and 159 burros from the HMA. The roundup was a devastating blow to California’s wild horse and burro population, removing more than one-third of California’s entire mustang and burro population which is estimated to be only approximately 5,000 throughout the entire state. The Twin Peaks HMA encompasses 798,000 acres of public land, yet the BLM allows just 448 to 758 wild horses and 72 to 116 burros to reside in the area. Meanwhile, the agency authorizes up to four times more cattle and nearly seven times more sheep to graze this federally-designated wild horse and burro habitat. Wild horses comprise a small fraction of grazing animals on public lands, where they are outnumbered by livestock nearly 50 to 1. The BLM has recently increased cattle grazing allotments in areas where wild horses are being removed. Currently the BLM manages more than 245 million acres of public lands of which cattle grazing is allowed on 160 million acres; wild horses are only allowed on 26.6 million acres this land, which must be shared with cattle. The Obama Administration has accelerated the removal of wild horses and burros from public lands in the past year, while Congress just last week approved funding for yet more BLM roundups beginning this July. There are currently more than 36,000 wild horses warehoused in government holding facilities and only 33,000 wild horses free on the range. In Defense of Animals is an international animal protection organization located in San Rafael, Calif. dedicated to protecting animals’ rights, welfare, and habitat through education, outreach, and our hands-on rescue facilities in Mumbai, India, Cameroon, Africa, and rural Mississippi. 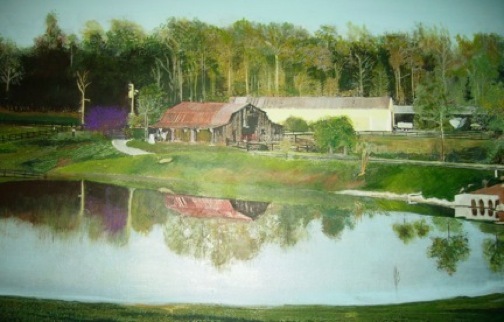 For more information, visit www.idausa.org. An elementary school in New york City has a great idea that’s going into action! Eighty school children at Village Community School will each assemble their own bird house kit, decorate, paint it and help install all 80 bird house kits in a nearby park. When administration first contacted us, we were more thrilled with the idea itself, than the net profit from a sale. 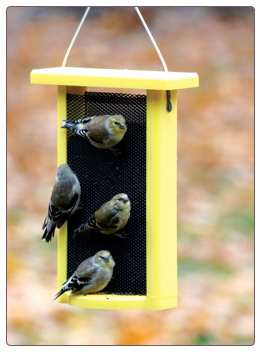 So much so, a deep discount was offered on the bird house kits, and they received a plethora of extras to further entice birds, and to get the kids more involved while making their project a huge success. Chickadee, Wren and Eastern Bluebird wooden birdhouse kits were ordered, but 16 packages of assorted nesting materials were graciously added. In addition, there was a wonderful Stokes Bluebird Book, and 24 “Pop-Outz” recycled plastic suet feeders, (which are perfect for offering nesting materials) along with a pamphlet on “attracting nesting birds” for each child to take home. Although bird feeder kits and bird food were thought not to be a smart idea for the area, we also sent along a few suet cakes and explained there would be no ground waste with which to contend. Now I can’t wait to see pictures of the project in progress or the finished product. Park services will be taking care of the water aspect as far as birdbaths or small ponds, making sure there are ample fresh water sources to help birds thrive. The birds in this area of NYC are getting a great make-over! 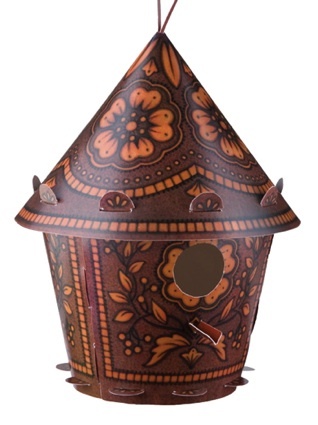 By the way… the tooled leather birdhouse kit shown here is actually recycled plastic-and super fun to assemble. It provides a real nest site for feathered friends and lasts for years to host many successful broods! a very cool hanging bird bath indeed! Although birds tend to bathe naturally at ground level, they usually flock to other fresh water sources too. 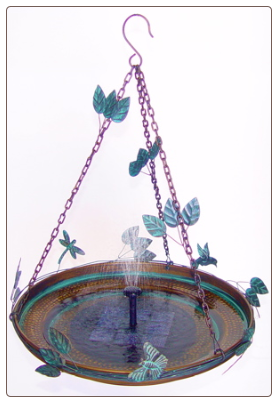 A hanging bird bath is the perfect choice for smaller spaces, or yards where ground predators (cats) tend to lurk. 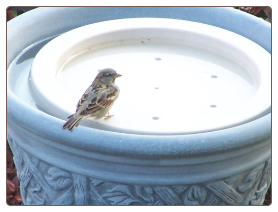 Fresh water in a bird bath is hands down, one of the best ways to entice more species to your place. 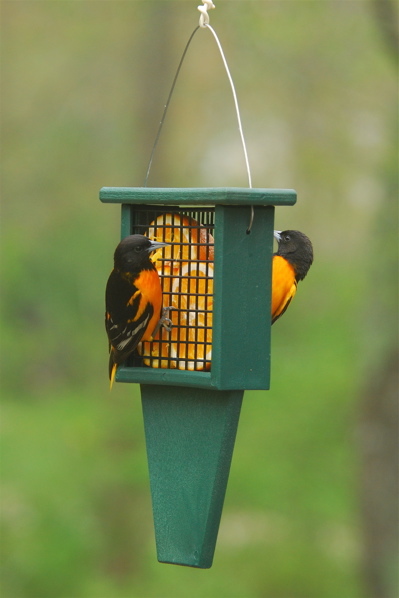 If that fresh water happens to be moving… well, it’s like a visual magnet for wild birds! Accessories like water wigglers, leaf misters, and bird bath fountains will absolutely increase the activity around any bath. Hummingbirds for example, are extremely fond of bird bath fountains and bubblers. They can be seen playing and bathing in them on a daily basis if they’re already feeding in your yard. Leaf misters are adored by butterflies and many songbirds too, including bluebirds. The misters are versatile, and may be attached to a plant stake, or a branch, or even a deck or porch with an over-hanging bracket. This hanging bird bath features a solar power mister that’s built right in. The valve is adjustable, so that on windier days a stronger flow or fountain may be used, as opposed to the gentle mist. Moving water really does attract more birds! This season consider adding some type of water feature to your yard, then sit back and see the difference while helping wild birds thrive. good through April 30th 2011. In anticipation of the opening performances of the Shriners Circus this weekend at the Shriners Auditorium in LA, ADI is determined to Break The Chain against attendance at circuses that use live animals. Please pass the word to animal supporters everywhere that a circus is no place for animals. Let people do the entertaining. LOS ANGELES, Apr. 8, 2011 – Animal Defenders International (ADI), a leading global animal protection group, asks Los Angeles residents to ‘Break The Chain’ of animal suffering by not attending the Shrine Circus at the Shrine Auditorium, 665 W. Jefferson Blvd., Los Angeles on Apr. 8-10, 2011. ‘Break The Chain’ aims to raise awareness of the reality of animal suffering in traveling circuses in the U.S.
Just last weekend, ADI released shocking new undercover footage revealing the terrible suffering of Annie, the UK’s last circus elephant, chained and being repeatedly beaten. Public outrage led to the circus signing over her ownership in the past few days and Anne is now at a safe place. Jan Creamer, President of ADI said: “Annie’s tragic story symbolizes the plight of circus animals and is a shocking indictment of the circus industry. Time and time again, our investigations of these circuses all over the world produce similar evidence of animal abuse, cruelty, and suffering and it’s now time to ‘Break The Chain.’ We are asking audiences to vote with their feet and stay away. “Together with local partner organization Orange County People for Animals, ADI’s mission is to stop circus suffering by communicating the behind-the-scenes facts to local communities where traveling circuses hold performances. ADI will be handing out “Stop Circus Suffering” leaflets to circus-goers. To join the Shrine Circus leafleting outreach groups for the weekend circus performances, please contact Matt Rossell of ADI at 323-804-9920. As the leader of the ‘Break The Chain’ campaign, ADI works with animal rights and welfare organizations across the U.S. to bring awareness on a local grassroots level to the communities in which animal circuses perform. Providing campaign assistance, program guidance and educational materials to local campaigners, ADI also reaches out to local governments to communicate its scientific findings to end circus suffering. For more than 18 years, ADI has effectively produced overwhelming evidence of suffering of animals in circuses as a result of extreme confinement, the constant traveling nature of these shows, and cruel training practices. ADI’s groundbreaking two-year undercover investigation on circus cruelty shocked the world, resulting in major changes in the U.S., South America and European countries. Courts in many countries have used ADI’s evidence to prosecute offenders while governments have been compelled to change laws in favor of partial or complete bans, such as the recent passing of Bolivian law 4040, which prohibits any and all use of animals in Bolivian circuses. Though ADI opposes circuses that utilize animal performers, it remains fully supportive of arts and entertainment and circuses that use only human performers. bye-bye go daddy… ya shouldn’t hunt elephants! St. Louis, Mo., April 6, 2011 – Since GoDaddy’s CEO proudly posted a video of his annual trip to Zimbabwe to hunt elephants for sport, many GoDaddy customers are taking their web business elsewhere. Venovix (http://www.venovix.com), a web hosting and cloud services company, has joined forces with this movement; announcing a new promotion, titled “NoDaddy,” that’s targeting GoDaddy users seeking an exit. Now through the end of April, Venovix is offering GoDaddy users free domain migrations for donating $2 per domain migration to the International Elephant Foundation. In addition, GoDaddy users who switch their web hosting to Venovix will receive their first six months of hosting (a $60 value) free with a one-year commitment. That’s $60 for a full year of Venovix hosting at $5 per month. The company’s web hosting features unlimited subdomains, email addresses and storage. Venovix is donating 20% of all hosting revenues generated from its NoDaddy promotion to the International Elephant Foundation, which translates to a $12 donation for every one-year hosting commitment. The International Elephant Foundation is a non-profit 501(c)(3) corporation of individuals and institutions formed in 1998 to promote conservation of African Elephants and Asian Elephants. The organization’s mission is to support and operate elephant conservation and educational programs in managed facilities and in the wild, with emphasis on management, protection and scientific research. They’re committed to saving African and Asian Elephants by providing funds and scientific expertise to support elephant research and conservation programs worldwide. To get started today, visit http://www.venovix.com/elephantconservation. For more information on the International Elephant Foundation, visit http://www.elephantconservation.org. Headquartered in St. Louis, Mo., Venovix LLC is a web hosting and cloud services company. Venovix offers a diverse range of business and data center services for small to large companies, including technology consulting, award-winning cloud-based software solutions, cloud-based data centers, server monitoring and management, migration and consolidation, disaster recovery, backup services, and dedicated servers. Founded to enable organizations of all types to benefit from the cost savings and advantages of cloud-based services, Venovix ensures its clients’ technologies and staff are aligned with their business goals. The company distinguishes itself by taking the time to understand its clients’ challenges; developing custom tailored solutions that cater to their specific needs. For more information, visit: http://www.venovix.com. Anyone who feeds squirrels, or birds for that matter, knows just how these furry little critters can be the biggest pigs! Seems whatever food you put out, it’s never enough. 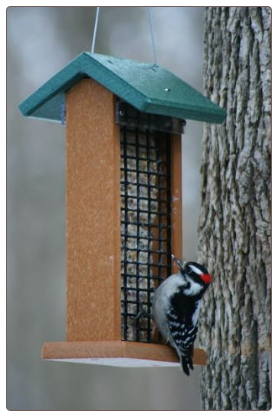 Some folks feed squirrels, while some folks absolutely hate them-either way the goal is to keep the out of bird feeders. Lots of fun squirrel feeders are out there, from the munch box kind where they learn to lift the lid to retrieve treats, to staked squirrel feeders meant for corn on the cob. These resemble porch swings, picnic chairs, bungee cords and other fun designs that are actually quite entertaining to watch the action. But corn cobs, even though inexpensive, will disappear fast, almost daily. 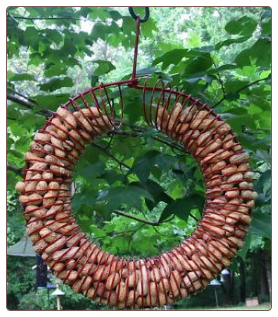 These corn logs are a great alternative if you have a staked-type squirrel feeder. They are compressed corn and equal to about twelve ears of the regular stuff. Perfect for squirrel feeders you don’t want to attend to on a daily basis. 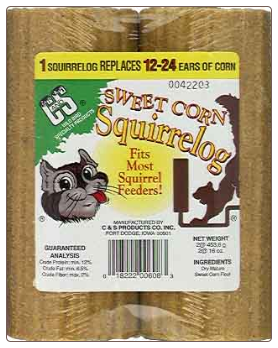 The squirrel logs come in sweet corn and corn and nut flavor which are dark brown in color. During freezing winter weather, we smear peanut butter on the smooth surface as a special high protein treat that helps squirrels stay warm. One thing though, be sure they are securely attached as our crafty critters have managed to steal them once in a while!